"What is necessary, Messieurs, let us say it, is a unanimous rising of Confederated Europe before the yellow peril!" 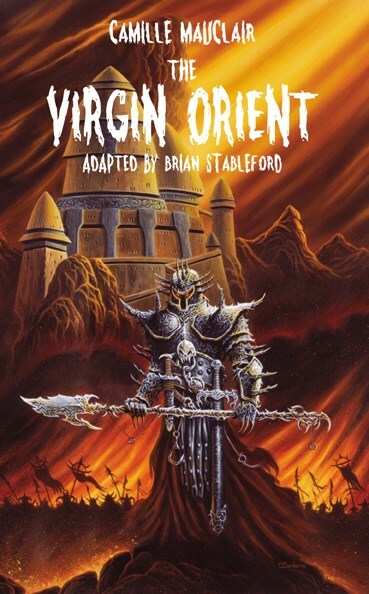 The Virgin Orient, an Epic Novel of the Year 2000 (1897) is the account of a preventive strike by Europe, united under the government of Anarchism, against the perceived Yellow Peril. Even though his accounts of two crucial battles fought in India are extended and bloody, Mauclair's primary purpose is not to detail the war but rather to analyze the crisis of conscience suffered by the Anarchist "dictator" once it is won. Included in this volume are nine other fantasy stories, including Crown of Clarity (1895) and The Poison of Precious Stones (1903), written in the Symbolist style, remarkable for their sheer bizarrerie and flamboyant imagery. Camille Mauclair (1872-1945) was one of the younger recruits of the Symbolist Movement that was a highly significant feature of the Parisian fin-de-siècle and included Stéphane Mallarmé, Remy de Gourmont, Jean Lorrain and Marcel Schwob. Introduction, Afterword and Notes by Brian Stableford.